Whether you know what ‘put a bird on it’ means or not, this one-of-a-kind Portland tour is a great way to learn about ‘Portlandia,’ a popular TV show created by Carrie Brownstein and SNL alum Fred Armisen. A fun and friendly guide takes you to visit filming locations around the city such as the real Feminist Bookstore. Plus, enjoy the goods at Voodoo Doughnut and one of the city's coolest coffee shops. 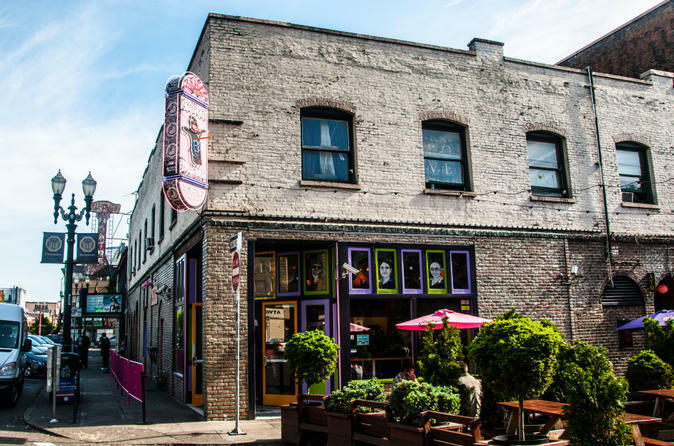 After pickup at your downtown Portland hotel or meeting spot, hop in your tour van with your guide and start your Portlandia tour at Voodoo Doughnut, a Portland institution where the line regularly flows out the door. Pick out the doughnut that looks most interesting to you — perhaps the beloved Bacon Maple Bar — and then head to a nearby coffee shop. When you order your complimentary third-wave coffee (don’t worry, your guide can explain what that means), recall the 'artisan' baristas seen on the show. Coffee isn’t the only thing your guide can give tips on: Feel free to ask for recommendations on local eateries, shops, breweries, bike rentals, and more. If you’re looking for the best deal on a mustache trim or a custom-made bow tie, it’s likely your guide knows the hippest places to go. Don’t be surprised if you spot said bow ties in a window display on a walk around the trendy Mississippi Avenue neighborhood. Stop in Land, an art gallery and shop where the show’s iconic phrase ‘put a bird on it’ was hatched. Afterward, continue to more filming locations including a popular area for food trucks and carts. Check out the location where the episode ‘Stu’s Stews’ was filmed, and then feel free to purchase any food you’d like from the trucks. Options include Asian fusion, barbecue and sandwiches. Then head up to Killingsworth Street to visit the In Other Words Feminist Community Center, a nonprofit lending library and event venue that serves as the inspiration behind Portlandia’s Feminist Bookstore. You'll also get to drive through the Alberta Street and Laurelhurst neighborhoods that have inspired many scenes and characters on the show. You'll make your way to the Verna Katz Esplanade, where the opening scene of the series, "Dream of the '90s," was filmed. Learn about the tongue-in-cheek skit where Fred explains how it's the city where young people come to retire, and unicycles are a normal mode of transportation. Your last stop is at the 'Portlandia' sculpture in front of the Portland Building — featured in Portlandia’s opening credits. From there, enjoy a ride (in your van, not on a unicycle) to your hotel or other downtown pickup point.